When I got into Mackinaw City this morning I helped jump a woman's car. Karma points, hooray! I couldn't believe it when she said she had asked another fellow first, who told her he didn't have time to dig out the jumper cables buried in his trunk. Have no fear - Good Samaritan Matthew is here, yeehaw! Then I hopped onto Star Line's Hydro-Jet Ferry, which boasts panoramic views of the Straits that includes the Mackinac Bridge, and produces a distinctive 35' roostertail spray! 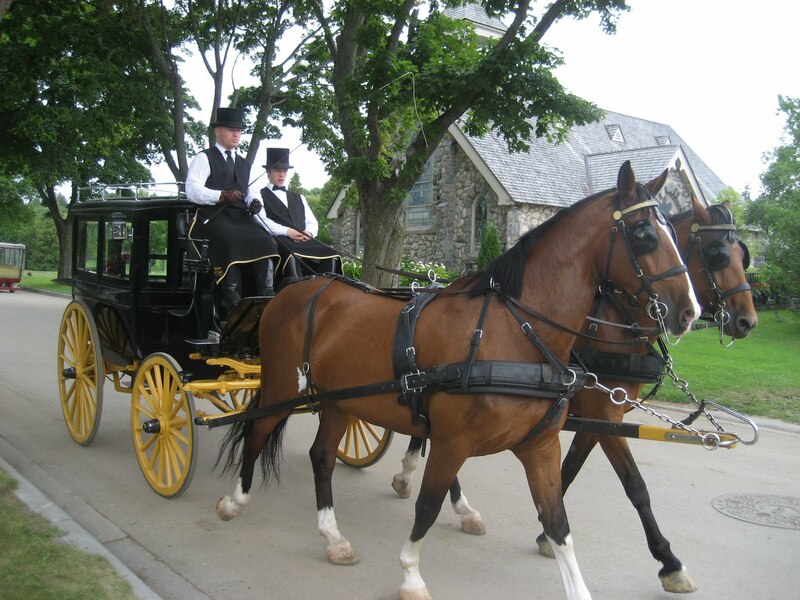 And I'm at Mackinac Island...who can forget stepping onto the island and catching that first whiff of horse manure? One which really puts the STINK in distinct. Eh hem [clearing throat], er, I mean, Mackinac Island: "vehicular traffic replaced by horse-drawn carriages, Victorian architecture, incredible rock formations, majestic views and historic ambiance combine to make Mackinac Island a destination unlike any other." LOL. After reconciling the sweet stench of horsie poo, one can let their hair down (granted they have any), kick back, and stroll the beautiful cobblestone streets, lined with historic fudge shops, inns and gift stores. I picked up some post cards (will I ever get around to sending them? ), and meandered the streets with the other wide-eyed pedestrians, bicyclers and horse-drawn carriages. I checked out the historic fort on the beautiful lawn overlooking Lake Michigan, peeked into the old homes of the early settlers and fur traders, and strolled the paved paths of the state park, which encompasses 80% of the island. As you approach the Grand Hotel, one cannot help but notice the indeed grand gardens and grounds and the imposing pillars of the historic hotel. One cannot also help but notice the signs notifying you of the $10 fee which must be payed to step one foot inside. Of course, I walked in, lol, and was immediately [we'll say] greeted by an hotel employee who asked me if I was a registered guest. I stated no I wasn't, but that I would like to take a look into a guest room to decide on a future stay (this is how I negotiate self-guided tours, lol). She snobbishly replied "no, there are pictures in here," and handed me a generic brochure. I placed the brochure on her desk and said, "I won't be needing this." Upon exiting the hotel I called and informed the front desk agent that my request to view a room was denied. They said, "Yes, the only ones that are allowed into the rooms are the guests," and she directed me to their website to place a reservation. Grrr. With [lack of] service like this, it is one hotel I shall have absolutely no interest in ever staying. I continued walking and looped back towards the harbor of the island where I reached the cutest little library, grabbed a magazine and kicked back on their seaside deck, overlooking families flying kites, a lighthouse, and the shoreline. When I arrived back at the mainland, I headed for Traverse City, where I would stay for the evening. Arriving in the city, I chatted with my good friend Alida, then went to a Arby's for internet access. I ordered the least expensive thing on the menu, grabbed a table, opened my laptop, and my attention was immediately stolen by a woman wearing a head-to-toe gypsy costume, ordering a coffee. I looked her over, looked at the people looking her over, lol, and smiled. *Was this a costume? I love meeting interesting people. We shall see. A couple of moments later I walked on over to her table where they had brought an extension cord over to her, and she pleasantly allowed me to take a seat. She immediately started telling me her story, about how she was fired from her job at the hospital, had her daughter taken from her, renounced her U.S. citizenship, and, after learning of my trip and tight budget, invited me to stay the evening in the subdivision building that she's not supposed to live in. She said I could arrive after 1am when she would be getting back from the concert she's going to, or I could sneak in through the basement window. It was sincerely a very kind offer, and the first stranger to make such an offer. She also gave me some tips on traveling cheaply, like pulling into a campground and simply asking to park there for the night for a few bucks, and that I should consider showering at civic centers that have pools. I finished checking my email and collecting local lodging info and said my goodbye and well-wishes to the gypsy-attired acquaintance I had made. So now the fun begins...finding free lodging. I tried a nearby state park, where the attendant refused me free parking. I continued searching, drove out of town a few miles, and found a luxury RV park. Yay! I parked where it said no overnight parking, entered the RV park office, which was open, unattended, and had private showers. Perfect! I went back into town and checked out a local gay bar which, as I had assumed, being only 8:30pm, was deserted, lol. Most of the bar/club-hopping gays I know don't go out until 10. That's okay, I was a little too tired for sampling the local nightlife anyway. I had second thoughts about the RV park, so I started driving around and didn't get far before I entered the parking lot of a grocery co-op where I found a young woman and her child walking toward my car. She said she forgot her keys in the store, which was now locked, and the store clerk inside dismissed her. I handed her my phone which she used to call the police (karma points! ), and when they arrived and the situation started getting sorted out, I resumed my free lodging search. I scouted hotels and found the perfect spot at the Hampton Inn chain. Safe, quiet, not too bright, and a parking lot that, apart from the explicit signs, said to me, "park here." I did just that, and rearranged the backseat to accommodate the passenger seat folding down, grabbed my eye mask to shut out the light, locked the door, and tried my best to sleep in my car in the nomad-not-wanting city of Traverse. Eventually the noise of the closing car doors and teens puttering about outside faded, and I awoke the next morning feeling rested. I cleaned up in a Wal-Mart bathroom a few miles away, got gas and set out for Grand Rapids. *It was not a costume. At approximately 4:00 this morning I awoke with rain falling on my face. I didn't care for it much, lol. 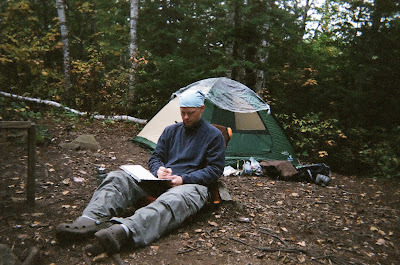 I grabbed my glasses and felt the corners of my sleeping bag near the sides of the tent - damp. I felt my pillow - damp. I felt the walls of the tent - damp. I felt the seams of the door - LEAKING. I looked under my cot - PUDDLE! GRRR. I put on my shoes and gathered my things into my car, and slept there for the rest of the night/morning. She was more than a five dollar tent to me. She was a shelter from the storm, well, not in the literal sense as it turns out, but we had bonded. As I felt her leaving my arms and descending into the dumpster, a tear almost sort of welled up in my eye, and I imagined my life without her. Munising Michigan may have your shell, but I have your spirit, oh cheap, but served-its-purpose-for-a-good-run tent. Thank you for your ventilated ceiling, your bug-proof walls, but most of all - for the good times. Today before boarding the boat for the tour of the Pictured Rocks, I sat on a bench overlooking Lake Superior and did my calculating - and whoa - I really have to be thrifty this time around! I have $46 per day - all inclusive - meaning everything - food, gas, toiletries, lodging, recreation. I'll incur miscellaneous travel expenses as well - toll fees, parking fees, oil changes and other standard vehicle maintenance, etc. Today I left Minnesota (again, lol) for Munising, Michigan, to get a look at sunken ships on a glass-bottomed boat, and to view the "Pictured Rocks." After a couple calls to the sunken ship tour company I finally found the place - only to discover I was 2 blocks down the street from it when I originally couldn't find it, lol. Oh Matthew. "Michigan protects its unusual wealth of sunken relics with nine underwater preserves, marked for divers and regulated to prevent looting. 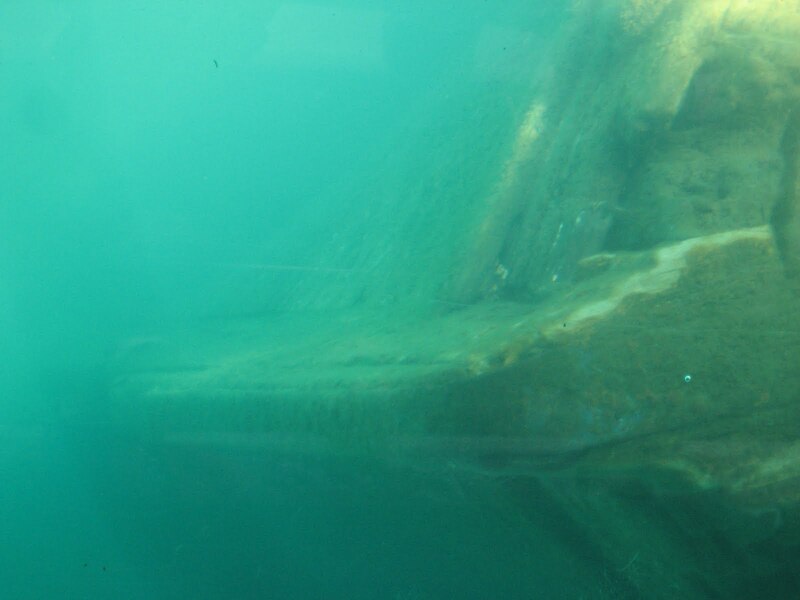 At the Alger Underwater Preserve near Munising, non-divers get a fascinating look at century-year old ships abandoned at the bottom of Munising Bay. Glass-bottom boats with large viewing wells glide right over the hulls and decks of wooden schooners, well preserved by Lake Superior's clean and frigid water. 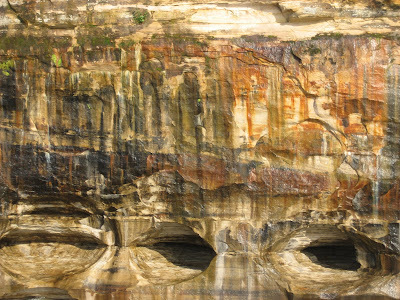 Just a few feet under the glass, they silently slide into view like haunting prehistoric paintings." I would say the most exciting spotting was a toilet. Good to know the captain of the ship was a refined gentleman, lol. After the two-hour tour of the sunken ships, I went to the Visitor Center and got information on local campgrounds. It was peak season, but I was able to hold a standard campsite at a place nearby. With that out of the way, I went to beloved Subway and ordered the usual - a tuna sub =) I then walked across the street for a 3-hour boat tour of the Pictured Rocks National Lakeshore, which showcases "a stunning stretch of coastline along the forested southern shore of Lake Superior, a natural marvel of sculpted sandstone cliffs, rocky caves, rocky coves and waterfalls." I went in the late afternoon, "when the sinking sun casts the multicolored cliffs in their most dramatic light." I got my ticket for the pictured rocks tour and had a little time beforehand to finalize my daily budget. Yikes. See the blog entry titled, "The Budget." The tour was great! Red, black, brown, blue, white, yellow, green, orange - all the different colors from the mineral deposits looked like cool, abstract paintings. 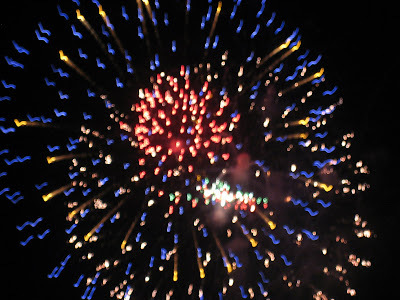 I want to take the photos I took and blow them up and put them on my wall - too bad my camera is only 6 mega-pixels, lol. I arrived at Wandering Wheels Campground, set up my tent, called my dad, and turned in for the night. Tomorrow I start my revamped journey. I plan to be back in Minnesota for Christmas, which will give me about 5 months on the road, an average of 3 days in each state, so I'll have to scale down on the things I see, but hey, it's all good. I won't have to worry about having internet access everywhere. Oh, and this time, I'm going to take less pictures. I mean c'mon, 400 photos for one attraction is getting extreme, lol, and you don't even want to know how daunting and tedious it is, getting them all uploaded! Catch ya'll on the flip side! Madison, IN: "America's Model 19th-Century Main Street"
"The meandering Charles Kuralt sang high praises of Madison, an American 'Princess of the rivers' founded in 1809 and named for the then-president James Madison. 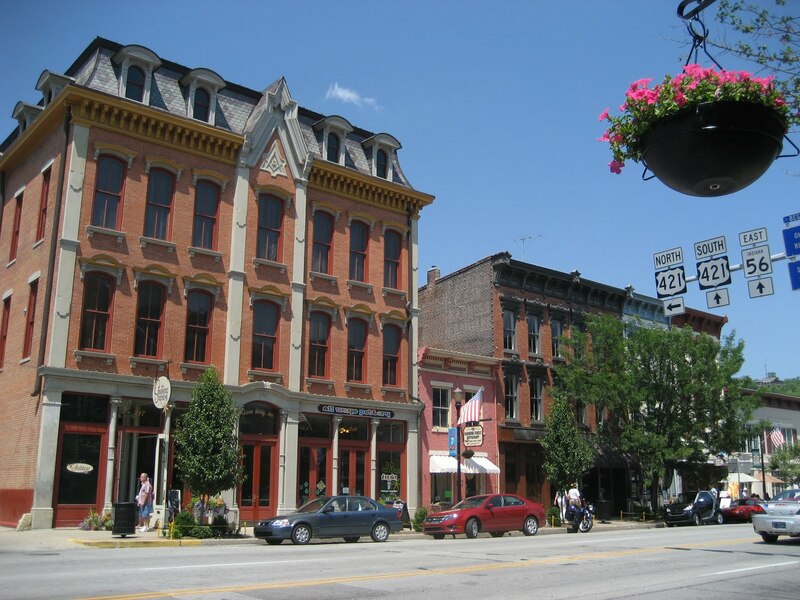 This sleepy town of 13,000 on the Ohio River in southeastern Indiana holds more 19th-century architectural beauties per block than any other place in the state - or most parts of the country. Its entire downtown area (approximately 1,500 residential, commercial, and industrial structures) is listed on the National Register of Historic Places - a rare and intact mix of Georgian, Federal, Regency, Classic Revival, Gothic, and Italianate buildings. Of the many landmarks favored with views of the river, the most visited is the Lanier Mansion (1844), the Greek Revival home of a railroad magnate. You can also visit the Eleutherian College (1848), the nation's first to admit students regardless of race or gender and a staunch opponent of slavery. Walk the self-guided tour of homes and learn of the town's role in the Underground Railroad, admire some of the most elegant wrought-iron work north of New Orleans (much of the railings and fences in the Big Easy were produced here), and don't miss the grand fountain on Broadway. The town's handsome Main Street is a particular point of pride, shaded by 200-year-old trees and lined with ornate 19th-century storefronts with appealing boutiques and cafes. A noticeable absence of fast-food joints and franchises evokes a nostalgic atmosphere." As I drove down Main Street into town mid-morning where I scoured the streets for a parking spot, it was impossible to miss all the wonderful, historic buildings I would be visiting later on. 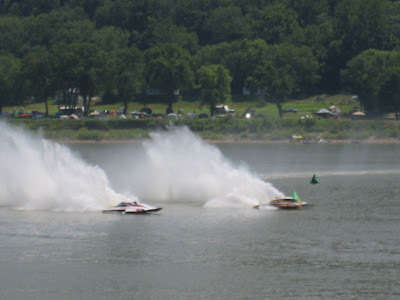 Anyway, I made my way to the entrance of the 2010 60th Annual Madison Regatta - "Indiana's Largest Lawn Party," where I watched the fastest boats in the country compete in weekend races. Later I grabbed a brochure from the Visitor Center and made my way down the streets appreciating all the old, well-maintained structures. After watching the Regatta I went to a local seafood place that was amazing! Lots of yummy, oddball things at their salad bar like pickled watermelon rind! After that I caught their air show and fireworks over the Ohio River. It was an amazing evening! The next day I went back to the Regatta for more racing and food, and then later in the evening I went to a corn field in a college town called Bloomington for fireworks. They gave hands down the BEST fireworks show I've ever seen! 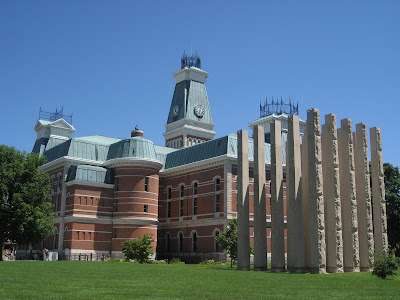 Columbus, IN: "Small-Town Marvel of Contemporary Architecture"
"It is said that architecture is frozen music, wrote Lady Bird Johnson, but seldom in history has a group of devoted artists produced such a symphony in stone as presents itself to the eye in Columbus." "The former First Lady echoed the praise of architecture lovers around the world when singling out the 20th-century wonders of Columbus, a small city in rural southern Indiana. Surrounded by farmers and cornfields, Columbus' repository of contemporary architecter comprises more than 60 buildings created by a host of world-renowned architects, including Pritzker Prize winners. Gothic, Romanesque, and Queen Anne dominated downtown until 1942, when Finnish architect Eliel Saarinen arrived with a more progressive vision and built the boldly modern First Christian Church, with its boxy dimenions and slender 166-foot bell tower. An equally contemporary Irwin Union Bank was designed by his son Aero, who later designed the landmark St. Louis Arch. The momentum had begun. In 1957, local industrialists J. Irwin Miller offered to pay the fees for A-list architects to work with the community in creating a showcase of modern architecture. The results have been astounding; Harry Weese, Robert Venturi (who created the fire station in 1966), Richard Meier, and their peers joined the parade. Today the mostly middle-class city of 40,000 people is proud of highlights such as the Cleo Rodgers Memorial Library, designed by I.M. Pei in 1969. On the tree-shaded plaza in front of the library (and across from the First Christian Church) is the monumental stone Large Arch by Henry Moore. Nearby, Gunner Birkerts' design for St. Peter's Lutheran Church showcases a circular sanctuary with a skylight and stunning copper spire that can be seen for blocks. Swiss artist Jean Tinguely's Chaos I, a 30-foot, 7-ton kinetic sculpture made of junk machinery, is the centerpiece of a downtown shopping mall and indoor playground park known as the Commons, built in 1973 by Cesar Pelli. In a survey several years ago, the American Institute of Architects ranked Columbus sixth in America for architectural innovation and design (just behing urbann heavyweights Chicago, New York City, San Francisco, Boston, and Washington, D.C.). 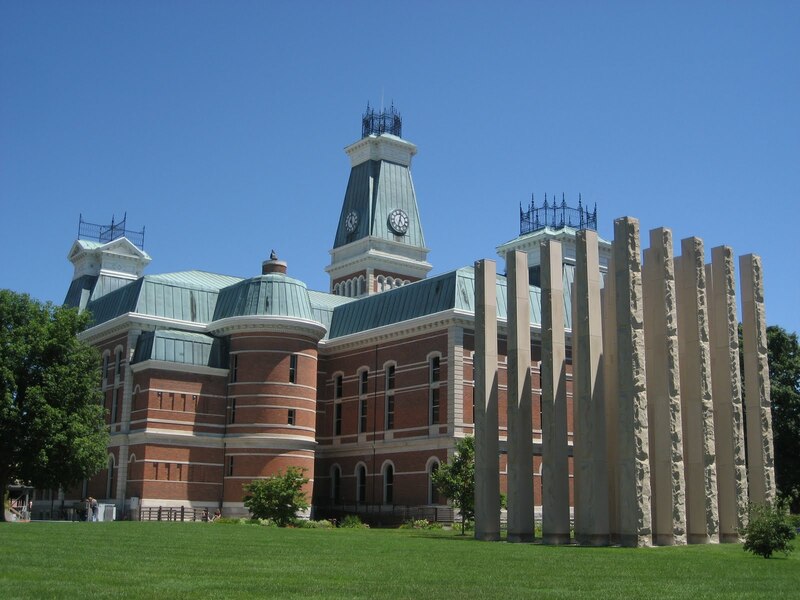 See for yourself by taking a guided one or two hour architecture tour, which departs from the Columbus Area Visitors Center. (While you're there, look up: You'll be dazzled by Dale Chihuly's Yellow Neon Chandelier, made with 900 pieces of delicate handblown glass). Across the street, the Columbus Inn, built in 1895, served as City Hall for a century before its present incarnation as a historic B&B. The elegant, antiques-furnished inn has 29 rooms and 5 suites and is a perfect home base for strolling around town. Try not to hold its grand Romanesque architecture-decidedly unmodern, after all - against it." For breakfast I had a FIVE "dip" sundae (in Indiana scoops are called dips) at Zaharkos (a seriously world-class, old world ice cream parlour built originally as a candy store by three Greek brothers in 1900) - all different flavors, it was piled so high with ice cream, whipped cream...mmmm. Later after getting laid [off from my job, lol], I took the bus tour (waste of money, there was no way to take pictures! ), which I took as a way to give me and idea of what I wanted to revisit on my own later on, then afterward I grabbed a self-guided tour map from the Visitor Center, opened it up and went WHOA. SO many sculptures and structures to see...I wasn't able to see every single one, but almost all of it anyway =) Who would imagine to find such a wonderful world of architecture and innovation in a small town basically set in the middle of a corn field?! One door has closed, and another will open. I'll head back to Minnesota for a while to get all the loose ends straightened out and reset, and then I'll take to the road again - this time I won't have to worry about "the man," and as I travel I'll keep an eye out for places I'd like to live and work - and even better I can look for another company that'll allow me to telecommute, so that I can remain mobile. I'm not ready to settle down and plant roots in any one place right now.